Small Batch Cannoli Recipe using homemade shells. Feel free to skip the more time consuming method and use store-bought! Place ricotta cheese on a stack of paper towels and blot out any excess moisture. If you use good ricotta, you probably won’t get much drainage. Transfer to food processor. Add cream cheese and process until smooth and creamy. Scrape sides of bowl. Process a little more, then add confectioners’ sugar, vanilla and lemon juice; process for another 30 seconds. In a medium size bowl, beat the cream until stiff peaks form. Fold the cheese into the whipped cream. Stir in the chocolate chips. Fill the shells before serving. To make shells, mix flour, sugar and salt in bowl of food processor. Add butter and pulse until mixture is mealy. Combine egg yolk, wine and vanilla and add to processor. Pulse until mixer comes together. If mixture still seems too dry, add water 1 tablespoon at a time until it comes together. Empty onto a sheet of waxed paper and shape into a ball. Let stand for at least 30 minutes or until ready to use. Roll dough as thin as you possibly can -- you might want to do this in smaller portions. For instance, break off some dough and roll it paper thin rather than rolling the whole ball. If you want, you can even break off little sections and then press them as thinly as possible with your hands. I've found that way the easiest. But if you want to cut them, roll out the dough and using edge of a bowl or large mouth wine glass, cut circles of dough. You can make them any size you want – I found the smaller cannoli easier to work with and by small, I mean about 3 inches across. Roll each circle of dough around a metal cannoli tube, overlapping the ends and press to seal. 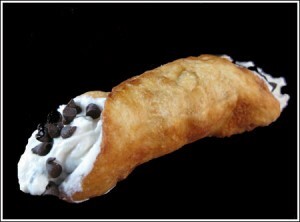 Try not to press the dough on too tight or the cannoli shell will be more difficult to remove. Fry two at a time in about a 1/2 inch of oil (about 360 degrees F.) for approximately 1-3 minutes, turning to brown all side. Remove from oil and set on paper towels to drain. Let cool for a few minutes, then carefully slide from tubes. Makes about 6 to 8 depending on how big you make them or how many you mess up.